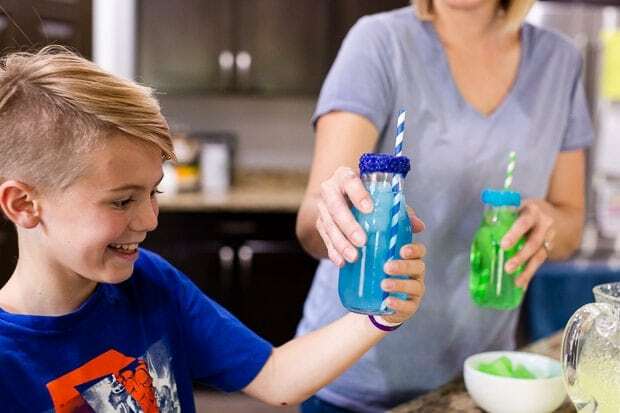 An easy kid’s drink and a little creativity make a great afternoon! This is a sponsored post. 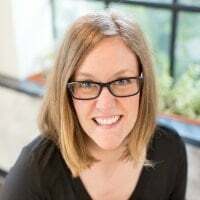 We were invited to write about Laser Pegs by ShopHer Media Influencer Network. A few days ago, my little guy Rowen came up to me and said, “let’s go out and have fun”. At first, I started to agree… and then it occurred to me… I have kind of created little monsters. I have a hard time sitting still. I like to be busy doing. As a result, I have often had to talk my two little boys — who would be happy to chill at home — that going “out” is fun. And no matter how simple, I always create something “fun” whenever we need to go somewhere so that they’re happy to tag along with their busy bee mama. When Rowen asked me to leave to have fun, the thought smacked me that I’ve created this idea that we can only have fun if we’re out doing something. We “can’t” have fun at home. Whoops. I’m now on a mission to change all that and reset expectations. I want my guys to realize we can actually have a blast being at home. A fun kid’s drink, a little creativity and a new box of toys does the trick. Nothing short of brilliant! My building crazy boys were in love. 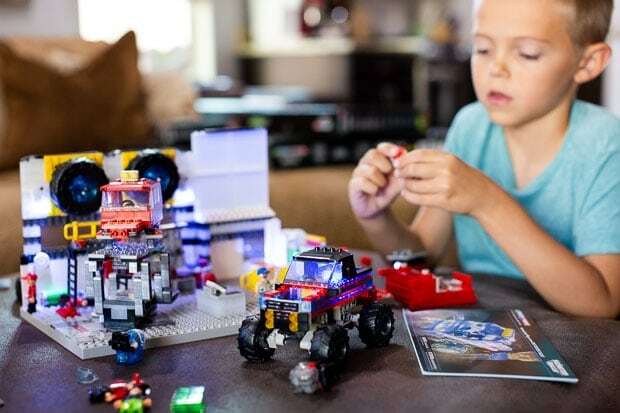 Laser Pegs offer a fun alternative to traditional construction sets by offering light bricks with vibrant color combinations. They create amazing colors all around as you build. 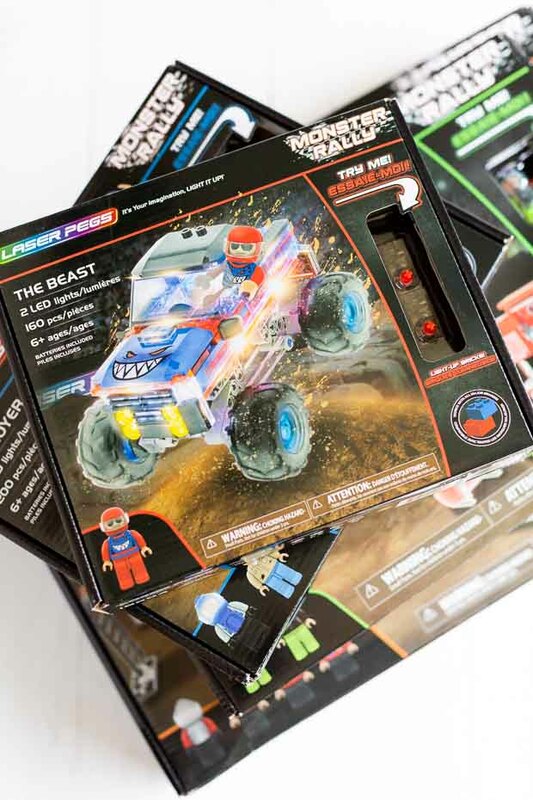 The Laser Pegs are also fully interchangeable with other construction toys! My guys had several sets to build with: Rally Garage, Fire’s Furry, Green Monster, Wrecker, Destroyer and The Beast. At first, they carefully opened each box and created just that set. 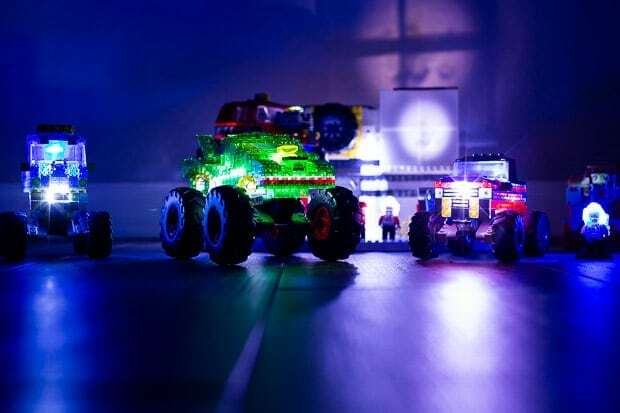 It wasn’t long before their imaginations were taking over and they were taking pieces from Rally Garage and adding in a little Green Monster and The Beast. I love seeing their imaginations at work! The former elementary teacher in me rejoiced as well: Laser Pegs are unique STEM toys that enhance learning of spatial relations, creative abstract thinking, problem solving and math skills by grouping, and improving hand/eye coordination. My boys got lost inside their imaginations creating fun structures and story lines with their creations, meanwhile their little brains were growing and they didn’t even know it. Hands down, one of their favorite features were the projector slides, which allowed them to project different pictures on the wall. I also love that you can order them on Amazon and have them delivered straight to your door. It’s so simple to get the creativity started! While they were building, I decided to make them a fun drink to enjoy. I was inspired by the bright colors of the Laser Pegs when I headed into the kitchen. 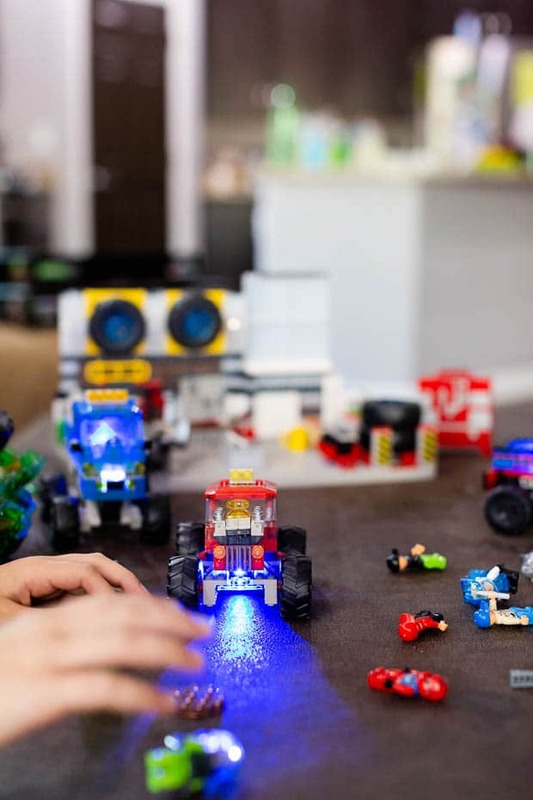 The boys had a blast with the Laser Pegs in the light — but there were even more happy squeals when I turned off the lights and they could watch their creations glow and light up the room. 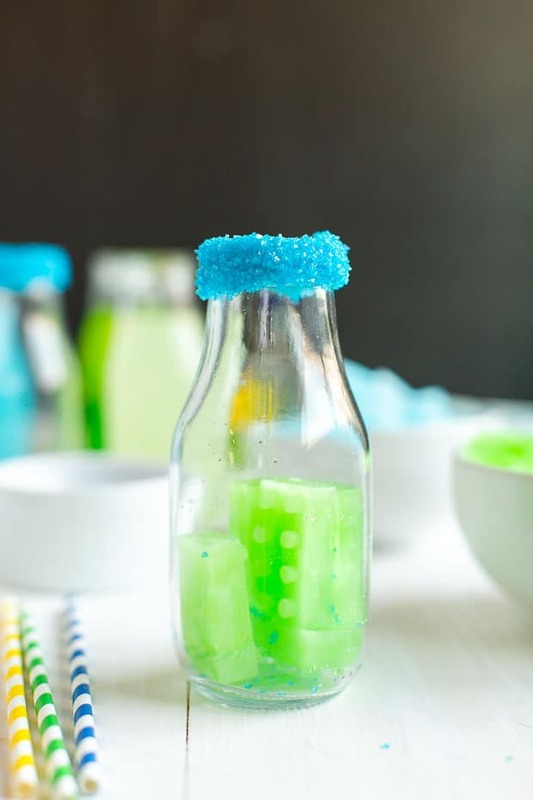 Inspired by the bright lights, this easy, fun kid’s drink idea was the result. The drinks practically glowed from the bright colors and the flavored, shaped ice cubes were a big hit. Here’s what you’ll need to create this sweet treat. 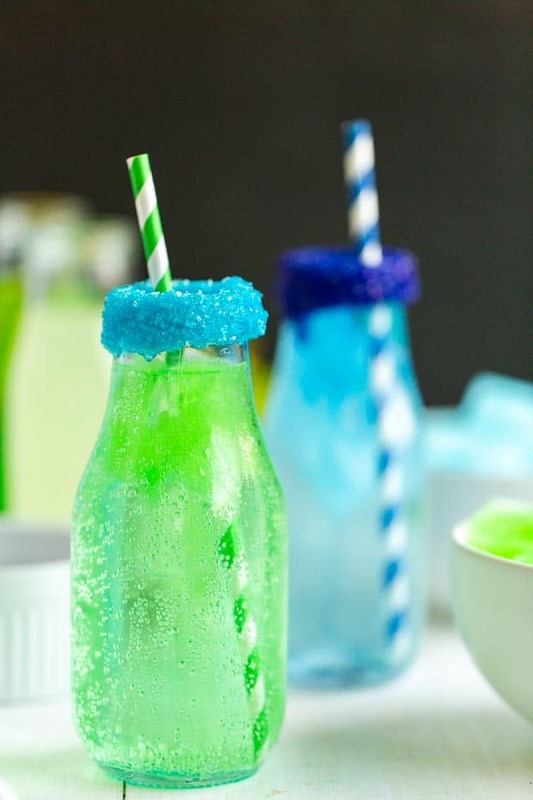 Grab green, blue and yellow powdered drink mix and make them according to package directions. A silicone brick mold, lemon/lime soda or club soda and melting chocolate. You’ll also want colored sparkling/sanding sugar, which you can find in a craft store. 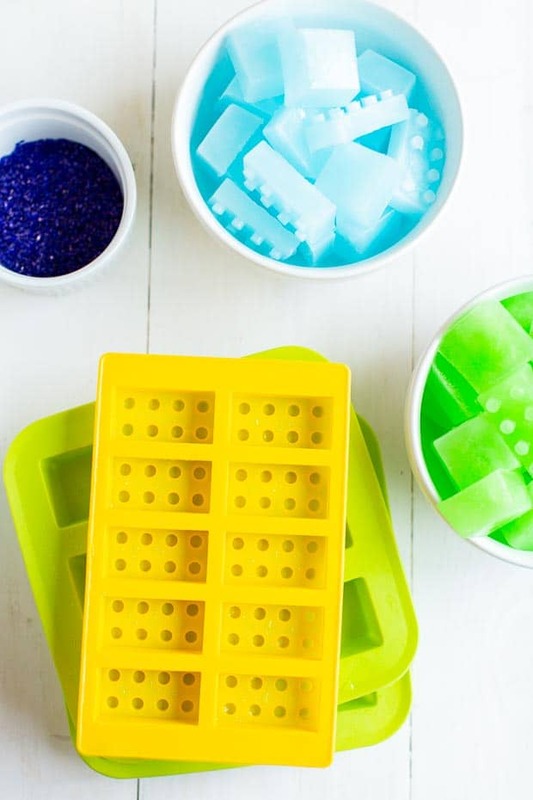 To create, begin by pouring the prepared drink mix into silicone molds and freeze. Place melting chocolate in a microwave safe bowl and microwave on high for 30 seconds or until melted. Pour the sanding sugar into individual bowls. Dip the rim of the cups using in the melted chocolate and then roll in the sanding sugar. Remove ice from silicone molds and place in the bottom of the cups. Fill to the top with lemon lime soda. Serve immediately. I think my mission was accomplished — my boys had FUN! Hours of it! 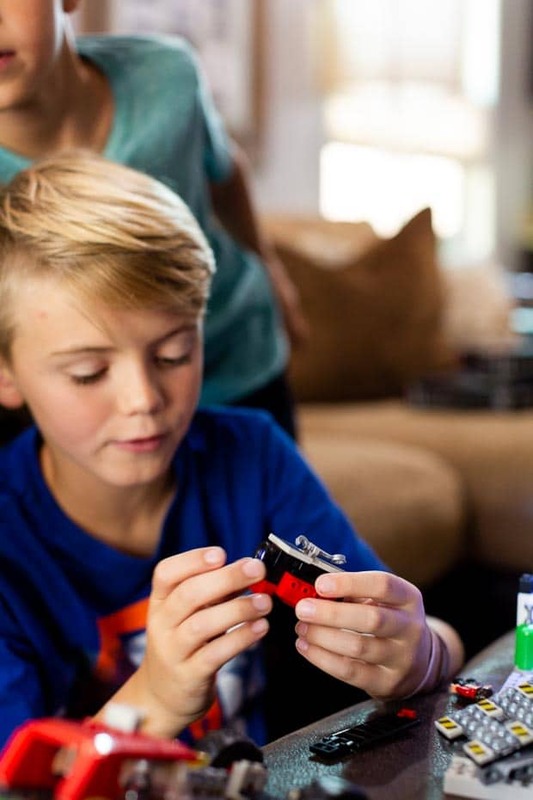 They had an amazing time creating with the Laser Pegs, enjoying their drinks — all while at home. I’m looking forward to our next building adventure with Laser Pegs together!